Education isn’t cheap. If you’re going to graduate from school but you need a little extra to cover the costs, you have a few options. Some of them are similar to the loans you (might have) used for an undergraduate degree, but others are specific to graduate fields of study. The federal government offers several loans for graduate students. You should start with these sources, as government loans offer benefits that aren't available from private lenders. In general, government sponsored loans have lower interest rates and are more flexible when it comes to repayment. For more details, see Advantages of Federal Student Loans. Unfortunately, as a graduate student, you can no longer enjoy the benefits of a subsidized loan. Interest will begin to accrue as soon as you get the money, so you'll want to be especially careful about how much you borrow. There are three types of federal student loans available for grad students. Perkins Loans should be your first choice. Unfortunately, they’re hard to qualify for - they're designed for students who demonstrate “financial need.” Your school might not even offer Perkins loans, and if it does you’ll have to compete with other students for limited resources. These loans are attractive because of their low interest rate: you’ll pay a fixed interest rate of 5%, which is better than you can do with most other lenders. As a graduate student, the most you can borrow per year using a Perkins loan is $8,000. Direct Unsubsidized Loans are another good option for graduate students (these may also be referred to as “Stafford Loans”). These loans allow you to borrow up to $20,500 per year for graduate school. You’ll pay a fixed interest rate of 6.8% and a 1% origination fee. This is more expensive than a Perkins Loan but most likely less expensive than offers you’ll get from private lenders. Of course, you should always shop around, especially if you have good credit and can get a great deal from a private lender. Direct Unsubsidized Loans are easy to qualify for as long as you’re enrolled as a student -- you don’t need to have a good credit score or income. Direct PLUS Loans (sometimes called “Graduate PLUS Loans”) are available if you still need money after you’ve exhausted your Direct Unsubsidized Loans. However, you have to qualify for PLUS loans. You can only borrow as much as needed for your “cost of attendance” minus any other financial aid you’ve received (such as Direct Unsubsidized Loans and Perkins Loans). You also have to have a credit history that is clear of certain events in the recent past. Bankruptcy, tax liens, repossessions, and other events in your credit files may mean that you have to find a co-signer to qualify for the loan. Graduate PLUS Loans come with an interest rate of 7.9% and an origination fee of 4%. To apply for any of the loans above, visit your school’s Financial Aid Office. It’s best to start the process as soon as possible if you think you’ll want to borrow money. Gather information and submit your FAFSA early in the year -- preferably in January. Submitting your FAFSA early improves your chances of getting grants and other types of financial aid. After you’ve borrowed everything you can through government programs, you'll have to look to private lenders if you need more. This is probably a good time for a common-sense reminder: just because you can borrow more, it doesn’t mean that you should. Remember that you’ll have to repay these loans, and they may haunt you for many years. Student loans are a great way to invest in your future, but there are countless horror stories out there about people who got in over their heads. Private student loans are available from a variety of lenders. Banks, credit unions, and online lenders offer private student loan products. Unlike the government, private lenders require that you qualify to borrow. You’ll need good credit and sufficient income to repay the loan, or you’ll need a co-signer who can help you qualify for the loan. Most graduate students are fairly young -- just getting started in the world -- and they have a hard time qualifying on their own. How much can you borrow from a private lender when you’re a graduate student? It depends on the lender and your field of study. In general, you can borrow more if you’re studying for a profession that tends to have higher earnings. In other words, future doctors and lawyers get to borrow more than future librarians. Private lenders even offer products that are specific to your field of study, and this is the one way that they might be more attractive than federal student loans. After you graduate, you may need to complete internship hours, pass licensing exams, or earn industry certifications. Some private graduate student loans include provisions that help cover your living expenses while you complete these tasks. How do you apply for a private loan? 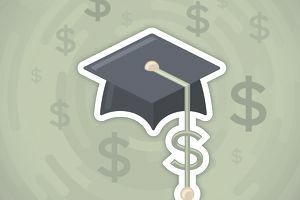 There are too many types of private graduate student loans to discuss here -- products vary from lender to lender and depend on your field of study. Start by searching for private loans, and narrow your search by focusing on the type of degree you’re pursuing. Be prepared to provide financial information to the lender, including bank statements, pay stubs, and school documents. In recent years, online lenders have made loans more affordable and easier to qualify for. That applies to student loans as well as personal loans (which can be used for any purpose, whether it's education or a new bike). Be sure to compare online loans to loans from traditional sources. If you can't get any special benefit from using a "student" loan, consider using a personal loan if the terms are better. You may end up with multiple loans once you've finished your studies. If that's the case, it may be possible to consolidate those loans into a single loan. Whether or not that makes sense will depend on the types of loans you have (private or federal), the interest rate on those loans, and other factors. Federal loans can be truly "consolidated," and private loans can be combined into a single loan as well.